What Do You Stuff a Pincushion With? Pincushions serve as a storage area for straight pins and needles. Pincushions also serve to keep the pins sharp and free of rust and corrosion. Pincushions may be small and pillow-like or decorative in appearance and function. Many sewing enthusiasts opt for teacup pincushions, as they're functional yet decorative. Others prefer scented pincushions. The type of stuffing will determine whether the pincushion serves to remove rust and corrosion, sharpen pins or whether it serves as a simple pin storage area. Whatever the stuffing type, be sure to densely pack the pincushion before sewing it closed. 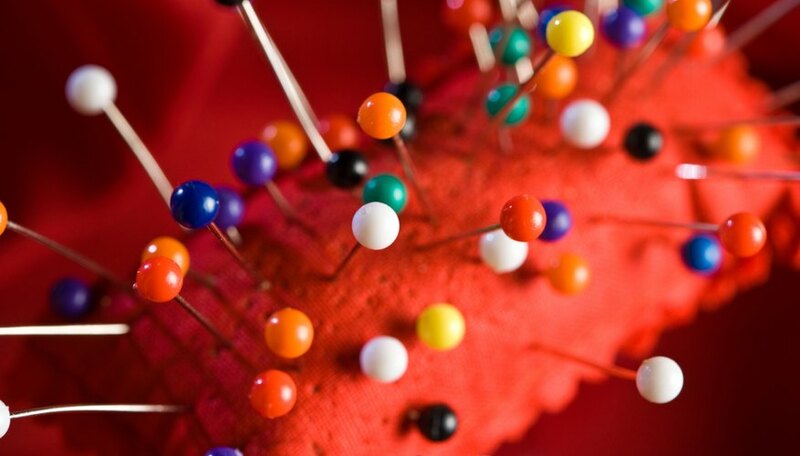 Densely-stuffed pincushions are more effective and the fabric will not move as you remove the pin from the cushion. Use dried herbs and spices to create a scented pincushion. Some herbs and spices, like lavender, mint and rosemary are selected for their aromatherapy qualities. Crushed pine needles can also be used for an evergreen scent. Herbs and spices must be ground into a fine powder before they're inserted into the pincushion. A small amount of essential oil can be added to the herbal powder for extra scent. Loose tea leaves can also be used. Herbs and spices are appropriate for use in a dry, inland climate and in other areas with low humidity, since the needles will not be prone to rusting. This form of pincushion stuffing will not serve to sharpen your pins and needles. When used as a pincushion stuffing, steel wool will sharpen pins and it will prevent rust and corrosion because the fibers will rub against the pin shaft when it's inserted into and removed from the pincushion. Fine- and medium-grade steel wool is ideal for this project. Steel wool pincushion stuffing is ideal for use in coastal areas and regions with high humidity, as the pins and needles are more prone to rusting and corroding in this environment. Sand is a suitable stuffing for pincushions that are constructed of a tight-weave cotton or linen fabric. Over time, small holes may form in loose-weave fabrics and as a result, grains of sand will leak from the pincushion. Like steel wool, sand also rubs against the needle and pin shafts, keeping the metal free of corrosion and rust. Herbs and spices can be combined with other types of stuffing for an aromatherapy pincushion that also serves to keep pins sharp and corrosion-free. Ground herbs and spices can be combined with steel wool or sand. These combination fillings have a lighter scent, which is ideal for individuals who are sensitive to strong smells. Combine sand and steel wool for a pincushion that's lighter than one with pure sand stuffing. The pincushion's weight may be a consideration for teacup pincushions in particular, since the pincushion may slump and sink into the cup. Avoid using pure polyester or cotton stuffing for the pincushion, as many believe that the stuffing dulls the pins and needles.